So it happened after all. Even if not legally. 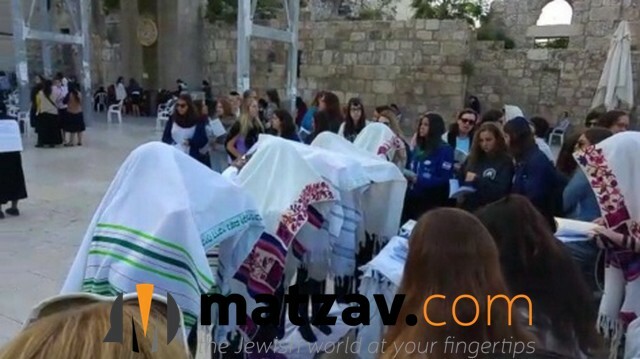 Despite Israeli Attorney General Avichai Mandelblit forbidding the rabble-rousing Women of the Wall group from holding a Birchas Kohanos ceremony in the ezras noshim of the Kosel, the WOW noise-makers held the fabricated ceremony this morning, Rosh Chodesh, in order to continue to antagonize the frum world and try to shake the status quo at the Kosel, as they have been doing with their “egalitarian” prayer section and their regular shenanigans, such as having women read from a Sefer Torah. WOW thumbed its nose at Mandelblit, proceeding with the ceremony anyway today. Police and Border Guard forces protected the women and sent away bprotesters, including the Chairman of Ateret Cohanim, Motty Dan. Throw these kurves in jail for mocking Judaism.